There are a lot of misconceptions about the consumption of salt and these 10 facts will help you understand which of them are true or myths. As we know, the chemical name of salt is “sodium chloride.” Therefore, from the salt we add to the food we consume a quantity of chlorine and sodium. We can say, however, that indirectly we consume salt from foods containing sodium as a natural ingredient. Foods that are high in sodium are animal based products. It has been estimated that from the salt we add to food we get 15% of our sodium needs, sodium found in food contributes for 10%, while the rest is covered by the quantity of sodium in packaged foods. The salt substitutes contain a proportion of potassium instead of sodium. But potassium, among other properties, influences and disturbs the heartbeat. Consequently, individuals experiencing any cardiac problem should consume it with caution and only after the approval of their doctor. Most packaged foods contain salt not only for improving their taste but it also functions as a preservative. Indeed, it is calculated that 75% of sodium intake comes from packaged foods. A significant quantity of salt is found in salted foods of all kinds, most cheeses, sausages, snacks and sauces. It must be emphasized that a person consumes salt from infancy. A baby who breastfeeds consumes less (breast milk contains 17 mg of sodium per 100 g.) while those who do not breastfeed consume more (cow’s milk contains 50 mg of sodium per 100 g. and artificial milks around 25-30 mg). The main reason you should not add salt to baby food is not to get used to the salty flavor from an early age which will lead to overconsumption in adult life. 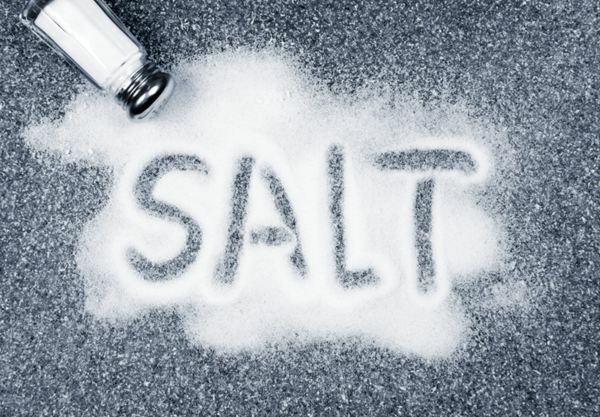 People who sweat a lot (athletes, those who do manual labor, but also those who are having a trend for hyperhidrosis without any health problems) need more salt to replenish the sodium lost from sweating. In this case, they should consume up to 5 g. salt per day. Recent studies showed that it is easier to cut down salt (for people suffering from hypertension) than sugar (for people suffering from diabetes). Experts suggest that this is happening because the human body needs less amount of sodium to function than what we consume. Therefore, the reduction of unnecessary quantity not related to organic needs is simply a matter of habit. The recommended intake of salt per day is 1.3 g. With the consumption of packaged products that contain it and the habit we have adding salt to our food, salt intake reaches 12.5 g. day, or ten times this quantity we need. Overconsumption of any product can cause direct or indirect health problem. Especially for salt, experts estimate that more than 30% of the population has elevated blood pressure, which is due to the high sodium intake. It has been observed that the restriction of salt in the daily diet results in a significant drop in blood pressure in many people suffering from hypertension. Also, the reduction in salt consumption by people who are on medication increases the efficiency of antihypertensive drugs. The fish, meat, poultry and eggs contain significant amounts of sodium, so they can be consumed with little or no salt, without being tasteless. By restricting salt in certain foods, you also reduce the amount consumed daily, which has a number of other health benefits.